Picking out doors for your home can be a difficult task, we’re here to help. We specialize in both interior and exterior doors in many different styles and species. Andersen patio doors are sure to open up your home and are available for order in a variety of options. Storm doors are also available to shield your exterior door from the elements or give your home some ventilation. 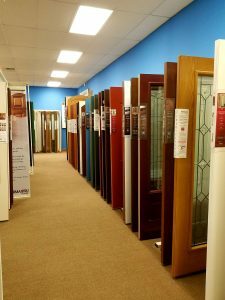 We have a bigger showroom than most, featuring all sorts of doors and styles sure to give you inspiration. Stop by to see our showroom or talk to one of our experts, we’re sure we can help. Over 50 Thermatru exterior doors on display! Our showroom also features a selection of wooden and molded interior doors, patio doors, and storm doors to help give you inspiration. © 2019 Newfane Lumber Company All Rights Reserved.